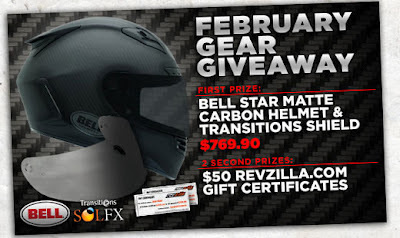 Tilted Horizons: Revzilla's February Helmet Giveaway! I bet you'd be happy with a high-tech motorcycle helmet such as the Bell Star Matte Carbon. I bet you'd be even happier if it were free. Hurry over to RevZilla's February contest page, create your Rider Profile, then wait for the lucky winner to be drawn. The First Prize winner this month will receive not only the Bell Star Matte Carbon helmet, but also a Transitions face shield, total value $769.90! Two Second Prize winners will receive $50 Revzilla gift certificates. While you're on RevZilla's site, take a look around at what RevZilla has to offer the serious adventure, sport-touring or sportbiking motorcyclist. Why shop RevZilla? I can tell you why I do: fast, free shipping for orders over $39.99; TeamZilla cash back program; "no hassle" exchanges; price match guarantee; and above all, RevZilla's top-flight reputation among riders I know for its customer service and product knowledge. Let 'em know Tilted Horizons sent ya! How about a direct link to the contest? All I found was their general monthly giveaway. Ask and ye shall receive. Check it now. Thx for the heads-up Nunya!